DFiT, Dusit Thani Pattaya: Visitors using the group fitness membership can avail of the THB 2,000 offer for five visits to the gym after their membership has expired. The offer includes unlimited use of DFiT facilities including tennis courts. For more information, call 038-425611 ext. DFiT. 2:00 p.m. Pattaya Sports Club Bowling at PS Bowl on the top floor of Tops Supermarket at the junction of Central and Second Roads. Contact La at PS after 1:30 p.m. Ocean Marina Yacht Club invites experienced sailors and learners for racing weekends and funsail/training weekends. The club has 5 star clubhouse facilities and a fleet of 25′ racing yachts available. www.omycsailing.com, phone Kev Scott 087 825 0011. Indoor Lawn Bowls Free at Coco Club every Saturday for school or college aged children from 11.00am – 2.00pm, with Male – English and Female Thai tutors. Parents can sit at the bar and watch. New champions needed! Call Sue on 087 135 8357 or pop in to the club at Baan Amphur – signposted behind Phoenix Golf. Badminton players are invited to play 3 mornings a week at Mama Badminton Club on Soi Khao Noi, Tuesday, Friday and Sunday from 10am-12 noon. For more information, visit www.pattayasports.org/sports/badminton . The Amazing Sunday Golfers are a friendly group of average index who welcome new players. 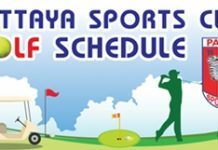 Each Sunday they have friendly games on different courses with a meeting point at the course. Contact Philippe at 082 546 0770 or email [email protected] to be updated each week for the upcoming game. 3:00 p.m. Pattaya Jungle H3 meets every 1st and 3rd Sunday of each month and departure is from the Lek Hotel on 2nd Rd at 3pm. For more info please call Kai on 01 863 5095. 3.15 p.m. Pattaya Hash House Harriers: The club for drinking people with a running problem meets every Monday at 3:15 p.m. in Pattaya Third Road, in front of the Buffalo Bar close to soi Lengkee, and just down the road from the Boxing Roo. We depart at 3:30 p.m. sharp. More info at: www.pattayah3.com. Chess and Scrabble Club: every Tuesday 12pm – 5pm at Hoek-Van-Holland in Jomtien. Take Thappraya Road to intersection with Beach Road. Dong Tan Police sub-station is right there. Walk back towards Pattaya 10 meters along walking path. Hoek-Van-Holland is on the right, before the parking lot. Bring your own chess set and/or scrabble board. For more information please see website www.hoek-van-holland.com – Everyone welcome. The Pattaya Chess Club meets every Tuesday evening from 6:30 p.m. onwards at Brauhaus on 2nd Road between Soi 7 and Soi 8. Learners and anybody who would like to play chess are most welcome. Boards and clocks are provided. 4.00 p.m. Pattaya Cricket Club practice nets at Thai Polo Club. All ages and abilities welcome. Please contact Simon at [email protected] or visit the club website for more information and ground location: www.pattayacricketclub.com. 7:00 p.m. Pattaya Panthers Rugby training every Thursday night at Horseshoe Point next to Siam Country Club. New players are always welcome – we are a very sociable team! Please contact Damian McCoy on Telephone 086 111 2816, Adrien Simon 095 705 0822 or send email to [email protected].